I know, quite the title. I just finished reading The Venetian Betrayal by Steve Berry. Woven into the story is an interesting history, some true and some dramatically altered, of Alexander the Great. The author provides enough detail to stimulate your imagination so as to visualize the events, places, and people. I love reading fiction where the author takes the time to research artifacts, buildings, places, events, and people and through carefully chosen words, brings them to life in my mind. I remember learning history in school… boring! I hated history. Maybe it was because I had none myself. Now in my 40’s, history really interests me. It certainly doesn’t have to be dull and boring for kids though. I think an inspired teacher can bring history to life for kids. But, what if we had a machine that could help? So, I wonder when might we see technology bring to life full digital immersive history? I can see schools and Districts putting together virtual reality (VR) head gear one 2 one projects then moving quickly to personally owned gear (POG). Student learning about our history will be fully experiential rather than boring text, static pictures, or made up movies. Imagine how history could come to life for students and how they could participate as “real life” characters. Perhaps they could reprogram history to test out alternative scenarios. Wow! I know, you’re thinking, “ya right, not in my life time”. But, think about what has been invented in your life time or in recent time (landphone, TV, fax, computers (mainframe-mini-desktop-laptop-tablet-netbook), cell phone, cars (rich history here), PDA, iPod, iPad, 3D TV, jets, rockets, shuttles, Internet (1.0, 2.0), etc. And think about how the invention cycle seems to be speeding up, perhaps exponentially. What this means is the pace of the last 10 years of invention will occur in a much shorter time frame and it’s speeding up every year. We will see amazing (impossible today) inventions in our time and I think K12 education systems will be huge beneficiaries of inventions like immersive virtual reality. What do you think? Possible? Useful? I learned a new way of running an organization that claims to honour good process, organizational purpose, and people’s time and energy. I will dive deeper in the the Holacracy method to see if there is a match for my organization. A core current running through the conference seemed to be that the technologists will save the world. Okay, that may be overstating things. On the one hand tech like gene manipulation and engineering will allow us to cure most disease, curtail or reverse aging, enhance our memories, muscle strength, thinking skills, create meat without animals, etc. This tech will allow us to grow new limbs and correct other damage to our bodies, and solve world hunger. The downside is, these ideas involve major tampering with genes, cells, and the use of nanobot technology (nanometer scale robots) inside our bodies and blood stream. There was much talk about “The Singularity” where machine intelligence will match than rapidly exceed human intelligence mid-21st century. 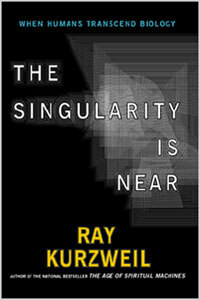 I’m currently reading Ray Kurzweil’s ‘05 book “The Singularity is Near” on my iPad to get some insight into this idea. The 1st keynote speaker Wendell Wallach called himself a “friendly skeptic of the idea”. An underlying belief is that our brains are essentially complex bio-chemical machines that can be reverse engineered and replicated in a machine. Kurzweil’s claim is that the exponential increase in computation, memory power, and decrease in size of machines along with the exponential decrease in cost will allow us to reach the point of Singularity for one human brain in 2029 exceed all human brains by 2048. He uses a lot of historical data to prove that technological evolution is at an exponential increase level everywhere and extrapolates that this will continue and accelerate. Wallach argues that we have so little understanding of our massively parallel processing, pattern recognizing brain and so many facets (vision, language, locomotion, learning, framing, semantic understanding, scaling, consciousness) that are so complex, that it isn’t likely possible this century, if ever. Turning to technology near term… there is a lot of talk about the Internet of Things (physical objects and systems all connected – roads, bridges, traffic lights, automobiles, clothing, anything) reaching 1 trillion “things” by 2020. Massive storage of information is coming… an “exaflood” of information (exabytes, read “huge”). Gordon Bell (now at Microsoft) is working on a project called My Life Bits to store everything known about his entire life and claims that in 15 years a small device that fits in the palm of your hand will store your “life’s bits”. The “Human – Computer Interface” session was all about gadgets. You’ve got to check out Project Natal – currently focused on gaming, entertainment, consumers but which has fascinating possibilities for learning. Light Blue Optics is a glimpse of what’s possible to provide a digital keyboard and screen to small mobile devices as well as the Nikon Projector Camera. Or for digital artists, the Leonar3Do enables 3D sketching. Digital photo frames (dime a dozen…) will go wireless and you’ll be able to push new photo streams to grandma 3000 kilometers away! The final keynote, Mike Rogers, a journalist and technologist talked about the virtualization of the world. He claims that the next 15 years will be as big a change in society as the 1000 year change from villages to cities. During that change, we extracted ourselves from our source of food – others now had to bring us our food. The move to the digital world will see us abstracting ourselves from the physical world – a blur between physical reality and virtual reality. Already many of us live our lives in both worlds. The difference will be that the virtual world will be more immersive, more realistically experiential, and will not have the same limitations as the physical world – this is good and bad… He talked about heads-up glasses being available in 5 years – project screen in bifocal area – appears as a full sized screen, connected via cell phone to the Internet, look up a map, look around see the map overlaid on the street, see restaurant reviews pop up as you see the physical place, recognize people’s faces automatically and bring up their Facebook, LinkedIn, twitter, etc. profile for you, all in real time. He claims that by 2020, every inch of the USA will have high-speed low cost broadband wireless access. By 2020, all automobiles will be intelligently connected to the Internet for Car-Car, Car-Infrastructure 2-way communication. Bridges, roads telling the car their conditions, car insurance on a subscription based on distance traveled, where you drive, how you drive. He sees problems… virtual space is really like moving to another land – we need to develop the rule of law, the Internet is really a lawless place today. Need real identities, perhaps online drivers licenses, new taxation methods, updated copyright laws. He worries about young people developing our new software and virtual places without the involvement of more senior people with life experience. To close, I see a common need emerging… that of ethics, morality, wisdom. I think there are a lot of scenarios that project good futures but every technology we’ve created has a dark use. We need to be more careful than ever before – the power to completely destroy ourselves is greater than ever. Just because we “can” create some new capability doesn’t mean we “should”. We may need to curtail our technology and inventions, etc. to minimize the risks. I am optimistic that we will increasingly work on the ethical, moral, legal aspects of potential futures. How does this relate to K12 education? In more ways than I can describe. We need to be preparing students and families for an exponentially more complex future, and there isn’t the luxury of long periods of time. How do we get the right people, those that can make change happen, engaged in foresight planning and modifying the priorities for learning? I think that is a key question for those of us in the K12 education system. Day 1 at the World Future Society has come to a close. Today I attended an all day workshop “Organizing at the Leading Edge: Introducing Holacracy”. The speaker was Brian Robertson from Holacracy One with the motto, “Liberating the soul of organizations”. You know how after lunch during a full day workshop the afternoon seems to drag on, you get sleepy,… well that didn’t happen today. The entire group (12 of us) were totally engaged past 5pm the scheduled end time. It was really that good. So what is Holacracy. Disclaimer: my one day exposure to this “movement” doesn’t qualify me to speak intelligently about it but I’ll give you my take on it. Brian Robertson talks about it using a software engineering metaphor: it is a new operating system for organizations or a fundamental upgrade to the core organization. The organization gains new capabilities and capacity that all processes can leverage. It is a practice, not just a model or theory – it is about doing, a new habit. Essentially it is a process that builds trust, diminishes ego, makes meetings exciting, fun, productive – that people want to attend. It is an organic structure that moves from Hierarchy to Holacracy and focuses on organizational purpose and moving towards that aim. It is a paradigm shift from Predict & Control to Sense & Respond, adapt course in real time – referred to as Dynamic Steering. Steer rather than plan – the plan will reveal itself as you steer. Remove the “addition to prediction” that provides the illusion of stability in most organizations. A key goal is to arrive (initially) at workable decisions, not necessarily the best decisions – reality will “tell you” what the “best” decision is via real time data - “best” emerges over time as adjustments to decisions are made. This is counter to the analysis paralysis organizations often live with. Delay all decisions to the last responsible moment (just in time), then make small decisions and deliver fast. A key process used is Integrative Decision Making, a method of including every person’s voice in the decision making process in an impersonal, non-emotional way. I’m not going to try to explain how this all works – I recommend you visit the Holacracy One website for more info. But, the essential ideas include using organizational circles and sub-circles to replace traditional teams. Circle members are peers, elect a facilitator. Circles hold Governance meetings, Operational/Tactical meetings, and Strategic meetings. Higher level Circles can form sub-circles. There is a Lead Link (aka manager) in each Circle that is accountable for the work of the Circle. A Rep Link from each circle sits as a member of its upper Circle. Circles exist at all levels of the organization. The facilitation process is quite different from what most of us are used to and are very depersonalized, unemotional, efficient, and structured. Meetings are predictably shorter, very purposeful, etc. Agendas are developed “on the fly” (interesting). Actions are dynamically surfaced, assigned, and executed. I think I’ll stop there and just encourage you, if you’re at all interested in organizational design or organizational change, to pursue this further through their website. I think this “movement” has the potential to help organizations perform better. I’ll definitely be seeking some deeper learning. I got up early (2:30am) to be on the road by 3:30 to YVR (Vancouver Airport). I got through security – was randomly picked for extra checks – had a choice of full body scan (aka digital strip search) or a pat down check, I opted for the pat down. Anyway, got seated in the waiting area, popped open my laptop, and connected instantly to free YVR wireless to do so work. Sidebar: last night I got my wife Shelley hooked up for Skype so that we can video talk while I’m in Boston. We did some trial runs so that she’d be comfortable with IM, Calls, Video calls, etc. Time came to board the Delta plane and I noticed they had a sticker on the outside that read “WiFi Onboard”. I asked the flight attendant about it, she didn’t think there was any (odd?). I got seated and noticed stickers on the ceiling saying “WiFi Onboard”. I read in the onboard magazine that once you’re past 10,000 feet, WiFi gets turned on – cool. I waited, then powered up my iPad, connect to WiFi (gogo Inflight Internet), created my account with the service provider, paid my $9.95 flight WiFi fee and got to work. I get on my connecting flight, fire up iPad, connect. All’s good. But, it asks me to pay again. I then notice I should have chosen the 24 hour service… I’m not paying twice! So, I get onto a (wireless) live chat with the service provider (while flying at 30,000 feet over 1000 miles an hour…) and tell him my sob story. He says he can’t upgrade me to 24h but he can get me a promo coupon – great! Long story short, I get a second flight of WiFi Onboard for free but worked it out in a live chat flying through the air at 30,000 feet. Is that crazy or what. If you haven’t seen this video yet, it’s funny and talks about how we just don’t appreciate the wonder and magic of technology. Later that night from my hotel room on my laptop on wireless, I skype Shelley. We have a video call. What a rich experience that is over a boring phone call! Did I mention, all on wireless. And isn’t it amazing that skype just finds us and connects us for FREE??!?? Okay I should mention our connect degraded 3 or 4 times, I lost total internet access for 10 minutes or so… but we persevered and reconnected and had our video call continue. Seriously though, we’re getting close in our society to “Wireless, Just like Oxygen”. I’ve been in the tech biz for over 25 years and I’m still amazed that this stuff works considering how complex it is.